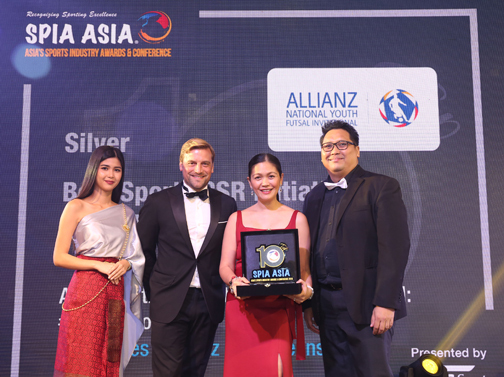 Bangkok—Allianz PNB Life bagged the silver award for Best Sports CSR Initiative of the Year during the recently concluded 2018 SPIA Asia—Asia’s Sports Industry Awards and Conference for the Allianz National Youth Futsal Invitational, a nationwide futsal competition that promoted the sport futsal to Filipino teens. Allianz PNB Life executives at the 2018 SPIA Asia—Asia’s Sports Industry Awards & Conference receive one of the sports industry’s coveted international awards. Alex Grenz (Second from left), chief operating officer, Gae Martinez (center), chief marketing officer, and Rei Abrazaldo, brand communications and digital director, are shown during the grand gala for the awarding ceremonies attended by more than 400 top industry executives from all over the world. The ANYFI taught them the value of teamwork, passion, and discipline, which led to the selection of the Philippine delegates to the Allianz Junior Football Camp Asian and global editions held in Bangkok, Thailand, and Munich, Germany. Over 400 sports industry professionals from around the world gathered during the three-day sports marketing conference, which was concluded with an awarding ceremony that recognized the best sports projects of the year. This is the fourth year the sports awards are being held. “Allianz supports grassroots development programs through sports. One of these projects is the holding of a national futsal competition that conveys our advocacy for social inclusion and youth empowerment. We are even more inspired now that a prestigious international sports award-giving body has recognized our efforts. This award has strengthened our resolve to continue similar initiatives and to reach out to more Filipino youth as we build relationships anchored on trust within the communities we serve,” said Gae Martinez, chief marketing officer, Allianz PNB Life. The other entries that won the Best Sports CSR Initiative of the Year were HSBC Try Rugby Programme of CSM Sport and Entertainment, an entry from Hong Kong, which garnered the gold award in the category, as well as the IBF Youth Leaders Basketball Cup of FIBA from Singapore as bronze winner. “The standard of entries has gotten better every year and this truly reflects the strength and depth in Asia’s sports industry. We have seen professionally operated independent events and organizations alongside some of the biggest brands in the industry, and this is very encouraging for everyone in sports in Asia,” said Eric M. Gottschalk, CEO of MMC Sportz, organizer of SPIA Asia—Asia’s Sports Industry Awards and Conference. Out of the more than 400 entries submitted this year, 10 finalists were chosen per category to vie for the top three titles. There were 20 award categories to choose from. There are no participation fees for each submission, but a pitch with a standard format from the organizers had to be submitted per entry. Some 37 international experts were gathered to facilitate the rigorous judging of the entries.